The Star Wars movies have been a part of the cultural zeitgeist for 37 years, and with Episode VII now in the works, a whole new generation of fans will soon be forged. While we still have 18 months to go until the next film is released, we can take some deep trivia dives to tide us over and get us up to speed for the next installment. Now, let&apos;s explore some little-known facts and figures about the galaxy far, far away. 1. &apos;Star Wars&apos; was not the original title of the film. In early drafts, the script was entitled Adventures of Luke Starkiller, as taken from the Journal of the Whills, Saga I: The Star Wars. Later it was changed to The Star Wars, and then, eventually, just Star Wars. 2. Chewbacca was inspired by George Lucas&apos; beloved dog Indiana. The dog was an Alaskan malamute named Indiana, whose name was the inspiration for another famous Lucas character. In Indiana Jones and the Last Crusade, Henry Jones (Sean Connery) explains his son&apos;s namesake: "Indiana was the dog&apos;s name." 3. Harrison Ford was no one&apos;s first choice for the role of Han Solo. Because of his involvement with Lucas&apos; American Graffiti, he was asked to read the role while screen-testing other actors. It was only after testing several prominent stars that Lucas realized he had his Han Solo all along. 4. But then, one of Han Solo&apos;s most famous lines was written by Ford himself. Right before he was lowered into the carbonite freezing chamber, Han was supposed to say, "Just remember that because I&apos;ll be back," in response to Leia&apos;s "I love you.” According to interviews with director Irvin Kershner, the line was later changed to "I love you, too." But no one liked Han&apos;s response, especially Ford, who improvised the now-immortal "I know." 5. Lucas dreamt big with his first choice for the voice of Darth Vader. Lucas originally wanted Orson Welles for Vader&apos;s voice but ultimately decided that Welles&apos; voice was too recognizable. Darth Vader was, of course, voiced by James Earl Jones. 6. The actor who played Darth Vader&apos;s body ended up causing a lot of drama. 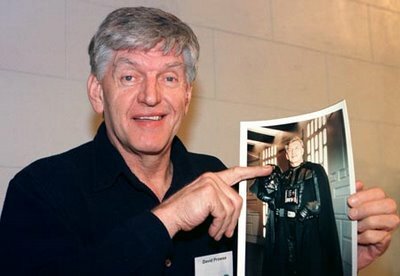 David Prowse, the actor who physically played Darth Vader, was very angry that his voice was replaced with that of James Earl Jones. He claims he was the victim of "reverse racism," since there are no other prominent black actors in the film (apparently glossing over Billy Dee Williams&apos; Lando Calrissian). Subsequently, Lucas has barred him from all Star Wars-related events, reportedly for "annoying" him. 7. The production of the first film was troubled from the start. The very first day of shooting took place in Tunisia, standing in for Tatooine, Luke Skywalker&apos;s home planet. On the first day of filming there, the country experienced its first major rainstorm in 50 years and a rest day had to be called. 8. In fact, &apos;Star Wars&apos; almost started a real war. Also while on location in Tunisia, the Libyan government became worried about what they thought was a massive military vehicle parked near the Libyan border. 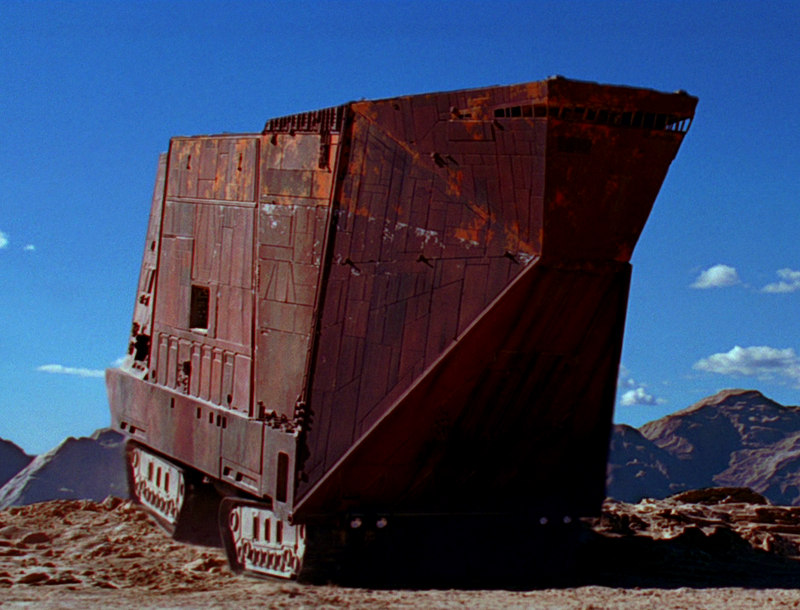 In response, the Tunisian government, receiving threats of military mobilization, politely asked Lucas to move his Jawa sandcrawler farther away from the border. 9. &apos;The Empire Strikes Back&apos; also started a George Lucas vs. union war. Lucas left the Directors Guild of America over a conflict about the opening credits of The Empire Strikes Back. The DGA required all films to have opening credits, but Lucas wanted to bypass them and go straight to the famous Star Wars crawl. Instead of acquiescing to their demands, he left the union. Steven Spielberg was Lucas&apos;s first choice to direct Return of the Jedi, but Spielberg had to pass because of his guild membership. David Lynch was then offered the chance to direct, but he turned it down and chose Dune as his next project. In the end, Lucas chose little-known Welsh director Richard Marquand, who some believe was a puppet and that Lucas actually directed the film himself. 11. The &apos;Star Wars&apos; franchise owes a lot of success to an unsung hero. That hero would be the first film&apos;s publicity supervisor, Charles Lippincott. 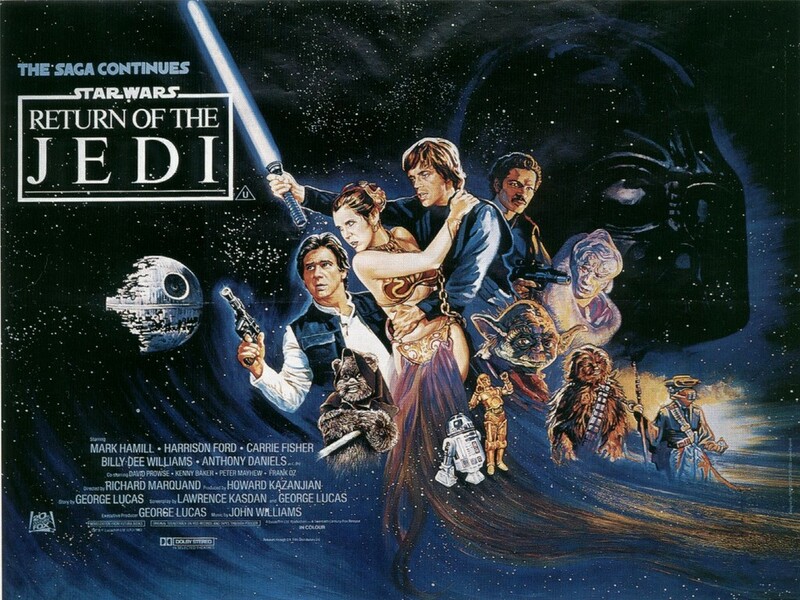 Aware of the power of the sci-fi fan, Lippincott went to conventions to promote A New Hope prior to its release and is largely credited with bringing in huge opening day audiences. 12. George Lucas did some unusual research regarding the original trilogy&apos;s most famous plot twist. Lucas had solid reasoning behind why Yoda corroborated to Luke that Darth Vader was his father. During the making of the film, Lucas consulted with a child psychologist, who told him unless it was unequivocally stated that Vader was Luke&apos;s father, moviegoers age 12 and under would dismiss Vader&apos;s claim to be Luke&apos;s father as a lie. 13. Lucas was also a pioneer in protecting against script leaks. 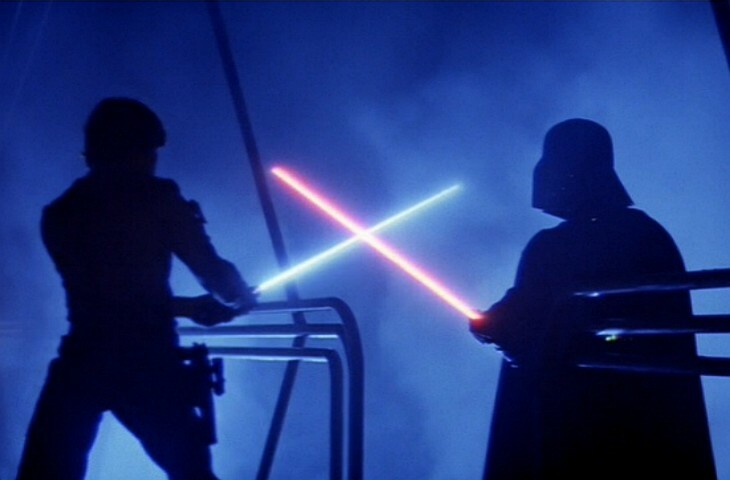 Empire&apos;s most iconic line — "No, I am your father" — was a secret to everyone but Lucas. 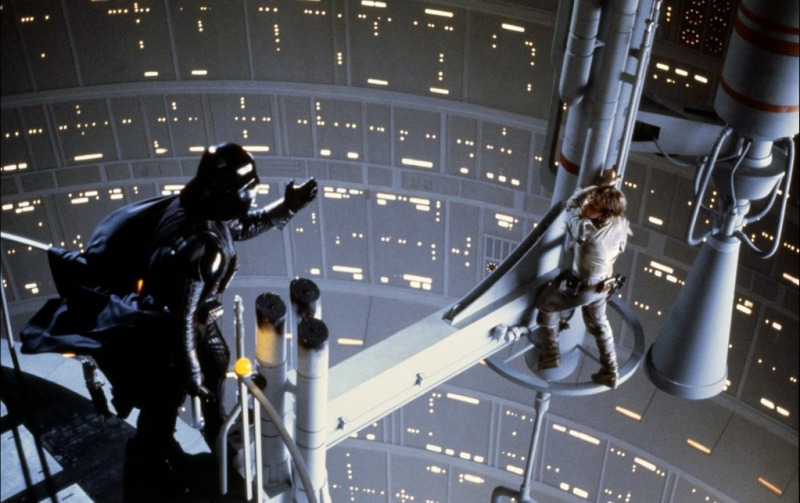 During filming, the actors had a fake script that read, "Luke, you are your own father!" None of the actors understood what that meant, leading Lucas to concoct a lie about time travel and the plot of the upcoming Return of the Jedi to appease them. 14. Yoda&apos;s look was inspired by one of the greatest thinkers of the 20th century. Introduced in The Empire Strikes Back, Yoda&apos;s facial features were based on Albert Einstein. Even the wrinkles on Yoda&apos;s lip were inspired by Einstein&apos;s famous moustache. 15. Thanks to Nien Numb, the franchise has a lot of fans in Kenya. In Jedi, Lando Calrissian&apos;s copilot Nien Numb speaks a Kenyan dialect called Haya. According to the sound designer, the lines were delivered by a Kenyan student living in the U.S. Audiences in Kenya were reportedly thrilled to hear their language properly depicted in the film. 16. Speaking of language, the Ewoks spoke an amalgamation of several languages. Some of their lines are in Tagalog, a Filipino language. Most of their dialogue, however, is in Kalmuck, a language spoken by nomadic tribes living in central China. A young man named David Fincher got his first job on the film as an assistant camera operator. Fincher would go on to direct such contemporary classics as Se7en, Fight Club and The Social Network. 18. Jumping a few decades, in &apos;The Phantom Menace,&apos; Benicio del Toro was originally set to play Darth Maul. Del Toro left the film after George Lucas took most of Maul&apos;s dialogue out of the movie. In the finished film, Darth Maul only speaks three lines. 19. George Lucas had a sense of humor about that whole Jar-Jar thing. In fact, some original scripts of Attack of the Clones bore the joking title Episode II - Jar Jar&apos;s Big Adventure. 20. And even huge movie stars become kids on the &apos;Star Wars&apos; set. During filming of The Phantom Menace, Ewan McGregor made lightsaber noises as he dueled. The sounds were corrected during post-production. Rumor has it that Hayden Christensen did the same thing the first time he was handed a lightsaber during rehearsal. The Senate contains E.T.&apos;s species of alien, a clever crossover between collaborators George Lucas and Steven Spielberg. In fact, one named senator, Grebleips, is "Spielberg" spelled backwards. 22. The plot of &apos;Attack of the Clones&apos; is rooted in real-life fascism. In Clones, the Senate votes to give the Supreme Chancellor sweeping emergency powers to go to war against the Separatist forces. This is the same tactic Hitler used to gain power in mid-1930s Germany. 23. &apos;Attack of the Clones&apos; was also the only film in the franchise to not be a top earner. Although it earned $302 million in domestic box office receipts, it was beaten by both Spider-Man and The Lord of the Rings: The Two Towers. 24. &apos;Star Wars&apos; and &apos;Revenge of the Sith,&apos; were made under completely different circumstances. Technology between the years these two films changed an unbelievable amount. One example of the technology: Every clone trooper in Revenge of the Sith is computer-generated. Not a single clone costume or helmet was created for the film. 25. The franchise&apos;s anti-union ways continued to create obstacles through the second trilogy. British actor Gary Oldman (The Dark Knight) had agreed to be the voice of General Grievous, but pulled out of the film because it was being made using actors who are not part of the Screen Actors Guild, of which Oldman is a member. 26. Chewbacca is a life&apos;s work. Peter Mayhew has basically just played Chewbacca his entire adult life. Revenge of the Sith (2005) marked his first return to the big screen since Return of the Jedi (1983). Between the two films, the only other movie he has done was Dragon Ball GT: A Hero&apos;s Legacy (1997), a made-for-TV movie in which he has a voice over role. He will return for Star Wars: Episode VII. 27. It all comes full circle. The newest entry in the Star Wars franchise recently took a hit when Harrison Ford, who will be reprising his role as Han Solo, injured his ankle when a door on the Millenium Falcon reportedly closed on it. Production on his scenes will be delayed up to eight weeks while the star recovers. Considering we have been waiting 37 years for this installment, two months doesn&apos;t seem so long.